More than flipping a switch, the decommissioning of the James DeYoung (JDY) power plant has taken years of planning. In 2018, HBPW completed several steps toward its decommissioning. 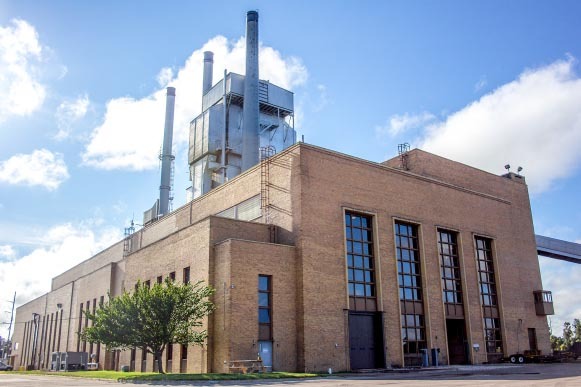 The power plant last burned coal on Thursday, April 13, 2016, but continued to run as a substation with distribution circuits to downtown customers and waterfront industry. With the completion of the Holland Energy Park and the new Pine Avenue substation, it is now possible to fully decommission JDY. The process started with the removal of the coal on the coal yard. HBPW was able to sell much of it to another coal burning facility. The cleaning also involved dewatering the ash ponds, pulling all the ash out and cleaning the coal yard. Research before the decommissioning process showed that in order to fully restore the area, including cleaning the yard and tearing down the building would cost $11 million. So far, HBPW has invested $3.5 million on the coal yard and ash ponds, and is beginning to look at the demolition options that exist for the building. However, HBPW is also looking at options that may involve repurposing the building envelope. While the decommissioning of the JDY power plant is the closing of one chapter, a second chapter is looking at what is next for the site. HBPW is working with the City of Holland to gather community input and create a vision for the waterfront through an initiative called Waterfront Holland. Find out more at waterfrontholland.org.